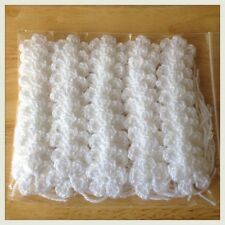 50 new handmade crochet small flowers in White colour. 100% Acrylic. 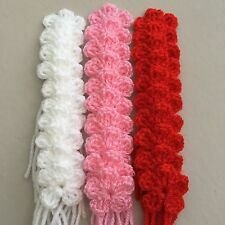 30 new handmade crochet flowers in pink, red, white colour. 100% acrylic. Set of 20 handmade crochet flowers and leaves. Made with quality DK yarn in autumn colours of burgundy, cream and sage green. Flowers are 5cm approx and leaves 6cm approx. Great for cardmaking, scrapbooking or crafts. I've left a tail on if you would like to sew or attach to items such as soft furnishings. Please contact me if you would like different colours or sizes. Baskets fit a cadburys cream egg or ideal for mini eggs. Great for Easter egg hunt. x 2 handmade crochet Easter egg basket decorated with a flower button. Li la c po t witha r ed flower. Lengthsof wool included. 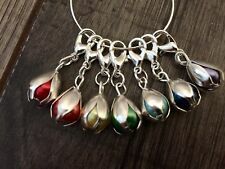 A lovely set of ten stitch markers, Flowers. 30 handmade crochet flowers in autumn colours 10 different colours, 3 flowers of each colour. Handmade crochet Flower & Pearl Bead. -These flowers are great for attaching to jumper,bag,card,headband,blanket,clothes,brooch,applique,decoration. -Grey and yellow soft yarn. x 6 crochet applique flowers, each with a leaf. Made with quality acrylic yarn. See photo for Approximate size Any questions please ask When purchasing multiple items and combined postage has not automatically been deducted, please request or wait for an invoice as I will be unable to offer reduced postage once items have been paid for. 20 handmade crochet flowers in 2 different colours - 10 of each colour. HAND CROCHET LITTLE FLOWERS. MADE WITH DOUBLE KNIT NEW WOOL. 10 IN TOTAL. 90 New handmade crochet stars , flowers in multicolored Each star measures approx. 4.5 cm wide flowers small 3 cm flowers 1.5 inches 100% Acrylic Suitable for crafts Please take a look at my other item Thank you for looking . Perfect for adding to granny squares, cushion covers, bags, hats, blankets etc. Poppies with sparkly red and black centre. 10 Handmade Crochet Flowers. Tails have been left on for sewing in. 3 Modern Crochet Coiled Roses & Leaves. Handmade beautiful crochet flowers will make a lovely addition to crafts, cards, clothes (especially babies and children's), scarves, hats, shoes, slippers, cushions, hair accessories, bags etc. Joblot CROCHET FLOWERS CUSHIONS BLANKETS BUNTING HANDMADE. Condition is New. Dispatched with Royal Mail 2nd Class. 18 tatting flowers about 3 cm across. handmade with crochet cottons. 6 X Large handmade crochet mandala flowers. Ideal for all crafts, sew on hair bands, blankets, hair slides etc. Each has a long thread for sewing on your item or can be cut off if not needed. Easily clip or sew this adorable crochet flower into a beanie, headband or right into the hair, which provides a simply way to add extra styling. 20 x Crochet Flower. - Great for sewing, craft, clothing, bag, scrapbooking, card making and more. 10 Handmade Crochet flowers. Colour pink. Made using 4 ply wool. Lovely for Easter craft work. beautiful to attach to cushions or blankets or any craft work. 3 green leaves. Condition is New. set consists of. With long tails for easy sewing. HAND CROCHET FLOWERS. MADE WITH DOUBLE KNIT NEW WOOL. 10 IN TOTAL. 18 CROCHET FLOWERS 3.5” / 9CM HANDMADE FOR GRANNY SQUARES BLANKETS ETC. Condition is New. If not needed, simply snip carefully off! 30 handmade crochet flowers. 5 x Pale pink. 5 x Dark pink. 40 handmade crochet flowers in 20 different colours - 2 of each colour If not needed, simply snip carefully off! They are suitable for a variety of crafts – applique, sewing on to scarves, hats, bags, clothes, soft furnishings etc. – especially my other crochet flowers & leaves. Handmade beautiful crochet flowers will make a lovely addition to crafts, cards, clothes, scarves, hats, shoes, slippers, cushions, hair accessories etc. Handmade with crochet cottons. Five red flowers. Perfect for adding to granny squares, cushion covers, bags, blankets etc. 10 Handmade Crochet Flowers. Tails have been left on for sewing in. If not needed, simply snip carefully off! 30 handmade crochet flowers. If not needed, simply snip carefully off! 30 new handmade crochet flowers in blue, lilac, pink colour. 100% acrylic. Beautiful handmade crochet flowers. Set of 20 in white. Could be strung together to make cute bunting. 12 tatting flowers about 4 cm across. Handmade with number 10 crochet cotton and beads.